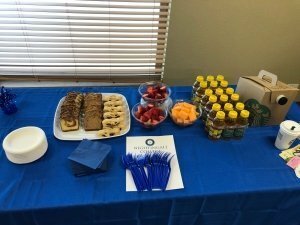 Refreshments at the Boise Networking Event Feb. 21, 2019. Morning networking events were held in Boise, Twin Falls, Roy, Draper, St. George, Evanston and Cheyenne. Partners and other local health care facilities were invited to meet learners and tour the hub. 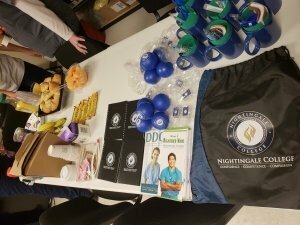 Health care professionals and hiring managers learned more about the unique Nightingale education model. Graduates were given the opportunity to connect with potential employers in their areas. These networking events were designed to connect learners with health care professionals and strengthen relationships between Nightingale collaborators, learners and partners. In Cheyenne, Wyoming, partners from local health care facilities met with learners to discuss career opportunities and special programs for new nursing grads. In St. George, Utah, many faculty members gathered to answer questions from learners, alumni and employers. And in Twin Falls, Idaho, partners met with collaborators to better understand the College and potential for a health care consortium. Although each networking event was different, a common thread was cultivating relationships. Success of these events depends on participation, what you put in, you get out. Face-to-face networking has the potential to open doors and build lasting relationships, something that is hard to replicate digitally. Step out of you comfort zone. You may want to remain within the group of familiar faces, but networking is the time to venture out of your cohort and make new contacts. Be curious. Really get to know the people you meet. Go beyond just talking about work and get to know them as a person. This makes the connection more authentic and enjoyable. Practice active listening. Show a genuine interest by maintaining eye contact and ask questions for better understanding. Ask for advice. Look to those who have some experience for recommendations on how to succeed. Networking events can provide a starting point for a mentor relationship. Stay in touch. Be sure to get their business card or contact information. Follow up with a brief email to let them know you enjoyed the conversation or invite them to connect with you on LinkedIn. Gifts for learners from our partners at the Cheyenne Networking Event Feb. 21, 2019. Nightingale College wants to extend our thanks to everyone who attended one of our networking events! We are also grateful for our dedicated faculty and collaborators who helped facilitate these opportunities for our learners and partners. The next event will be a job fair in the fall. We hope to see you there! Have you ever struggled with a particular class, concept, instructor, or learner? Learner Services can help. If you just need someone to vent to, someone to help you, someone to advocate for you, LALR (Learner Advising and Life Resources) counselors are the best way to access resources. LALR counselors can help you find resources in your area. Maybe you’re relocating from across the country and need someone to help line up a place to live. With a counselor specifically assigned to you, you don’t have to feel like you’re putting anyone out when you call needing some help. Finding quality care for children is a concern of many of our learners. Many work full time in addition to going to school, so they need centers and caretakers that will be flexible with their clinical and work hours. LALR is familiar with their concerns and can help them find a solution that will work for them. Struggling with a certain concept? LALR counselors can connect you with tutors who can help you grasp certain hard concepts. Dosage calculation can be a bear, so don’t worry, you’re not the only one who has asked for help! There are certain concepts that are just harder to grasp than others, and our LALR counselors are happy to help find knowledgeable tutors to assist you in your journey toward a nursing degree. Some of our learners require special accommodations to attend our school. Whether it’s a physical disability, learning disability or mental challenge, our counselors are your biggest advocates. 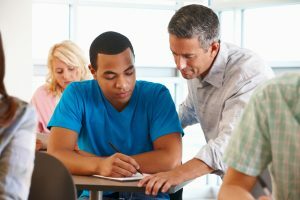 Not only can they give you the proper documentation for your special requirements, they can provide moral support as you interact with other learners and your instructors. Many of our learners are veterans, active duty military, and spouses of military members. If you fall into one of these categories, please let us know! Our military advisor, Eric Cox, is a Air Force and Army National Guard veteran. He is an expert on all things military. He can connect you with our financial aid advisors who can help tailor your financial aid to include your military contributions. Not only that, Eric is keen on working with our faculty to help your schedule be more compatible with your branch’s demands. Are you feeling bullied or picked on by another learner? LALR counselors can help you navigate those sensitive situations. The LALR team would listen to the learner and acknowledge their feelings. With their permission, they would talk to the bullier about our values and what it means to be a part of Nightingale, and how bullying goes against those values. We would also get instructors involved and hopefully get insight from them on the situation. LALR counselors don’t deal only with things that affect your academic performance, they help you stay emotionally and mentally healthy throughout your program. They can help you work out job schedules, plan your time better, and learn how to study. They also help you deal with other issues in your life that could be affecting your performance at school. They are your biggest cheerleaders! Don’t miss out on this opportunity to have people invested in your success. Email learnerservices@nightingale.edu to get started!